I read this article and found it very interesting, thought it might be something for you. 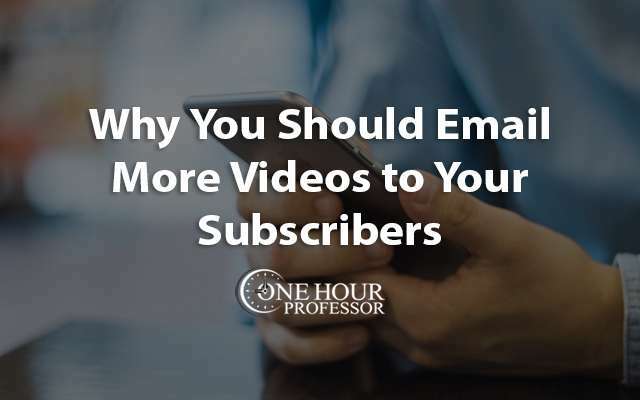 The article is called Why You Should Email More Videos to Your Subscribers and is located at http://www.onehourprofessor.com/why-you-should-email-more-videos-to-your-subscribers/. Recently I was approached about a guest blog post and I thought this would be a good fit. Interesting insight for those that aren’t using videos in their own emails. Truth be told, I think I’ll be taking some tips here and using them myself. It’s no secret email marketing is a valuable tool for any business, but email video marketing is essential. If all you are sending your subscribers is paragraph after paragraph of text and images, you may end up hitting—or have already hit—a big roadblock. That is, lack of engagement. Sending a video via email to your audience skyrockets engagement unlike any other medium. As long as you follow the email marketing video best practices, sending videos to your subscribers guarantees more community between you and your audience. Even if you have no clue how to send a video through email, you can start learning. Not only will this article convince you that your email marketing strategy needs to introduce videos, but it will also serve as an email marketing video tutorial to get you started. Implementing a whole new strategy into your marketing campaign sounds like a lot of work, I know. But, if you take advantage of inexpensive email video marketing software and follow the video email marketing tips below, you’ll be leading your business to new horizons you never even knew existed. What’s so Special About Video? Email subscribers are three times more likely to share your content on social media than visitors from other sources. 93% of marketers use video in their campaigns, 60% use video for email marketing, and 82% agree that video positively impacted their business. Businesses with video marketing strategies grow revenue 49% faster than companies without video. According to one study, emails containing video receive 5.6% higher open rates and 96.38% higher click-through rates. The number of email subscriber opt-outs decreases by 75% with the incorporation of video. Press releases that include video are viewed 970% more times than text-only PRs. 62% of consumers build a negative perception of brands that publish poor-quality videos. If these statistics don’t prove to you that video marketing is worth trying out, then I don’t know what will. First of all, figure out what kind of video you want to make. Are you going to make an explainer video? Tutorial? Comedy video? Educational video? Or something else? Make sure your choice is relevant your niche. For example, if your target audience is expert chefs, you probably don’t need to educate them on anything but instead encourage discussion by analyzing different methods of boiling eggs. Remember, at this point you don’t have to have a creative video idea yet—just know what kind of video you’ll be pursuing. Next, do you want the video to be live-action or animated? This decision is important because it will determine a lot of your production and planning decisions. If you choose live-action, you will need to get the right equipment: camera, microphone, actors, props, music, etc. If you choose animation, your focus should be on finding the right software, animators, music, and voice actors if necessary. From there, it’s time to start brainstorming. This step includes thinking of a video topic idea (for example, “How to attract more buyers to your Etsy shop”) and how you will execute your video (Am I going to interview successful Etsy shop owners or create a list of tips and tricks to help the viewers?). Make sure the content you choose to create is valuable to the viewer! Any form of video marketing is useless if the video itself will not attract viewers and encourage shares. Also consider how you are going to make your videos stand out against competitors. This is the final phase of thinking of an idea—bring it all together by knowing your video topic, type, and style. The best part about starting this new journey is that you do not have to do it alone. As Ron Stefanski has said, you can’t do everything better than everyone else (link). Especially if your business is new to email video marketing, the smartest move you can make is coughing up the extra dough to outsource. Thousands of video email marketing services are available online that only want to help your business reach its full potential. Then, you will have more time to focus on what you do best. A good service for this is Valoso, an online freelance video editor and videographer marketplace. In other words, Valoso is like an Upwork for all things video. So you get to set the budget and deadline, choose the video editor or videographer, and experience a final outcome that suits your vision. You can also check out websites like Lumoid to rent out videography equipment like mics and high-quality video cameras. Explain the video. I’m sure this is kind of obvious to most of you, but do not just email your video and expect your subscribers to watch it. Tell them to watch it. Explain why they should watch it. Maybe even throw in a surprise in the video so subscribers will have to watch it (a hidden annotation to a free infographic or an expert tip at the end of the video). Keep it short. 60% of viewers who click on a video that is less than a minute long make it to the end, while only about 37% make it to the end of a 5-10 minute long video. If you stick it all of your extraordinary content into one 20-minute video, many subscribers won’t even click on it in the first place, let alone stick around until the end or share the video. But, if you can hook more viewers with a four-minute video, they will discover the value of your content and won’t be able to resist watching more. Stay mobile-friendly. Online video now accounts for 50% of all mobile traffic, so staying in touch with the iPhone, Android, and tablet users is important to extending your reach. Most video emailing services conform to mobile viewing, but still make sure it is easy for subscribers to watch your video on their mobile devices. You can easily lose viewers if your content is frustrating to access on mobile. Include a call-to-action… everywhere. By everywhere, I mean stick call-to-actions in the video itself, in your email, throughout social media, on your blog or website, and any other place you can think of. Video marketing does not have to just take place on email. You can market your awesome video through all of your other social channels, as well. Do not expect your viewers to share the video on Twitter or Facebook, to download a free PDF, or to leave a comment on the video sharing their opinion unless you compel them to do so! There is no doubt that email marketing alone won’t allow your business to reach its maximum potential in terms of audience engagement, conversion, and outreach. You need video. Video introduces a whole new platform for your business to experiment and succeed with. Now that you have made it to the end of this article, you know exactly what to do. Even if you have already started video marketing before reading this article, it’s time to improve your strategy. If you are a complete noob, take what you learned here and start today. Think of an idea, execute that idea, and then promote. What will your video be about? Brenna Clarine is a freelance blogger who loves writing and editing articles on a variety of topics. Check out her work at the Valoso blog, and benefit from her company’s awesome freelance video editing and videographer services at Valoso. Cool article, and great tips. I think you’ve captured the major points in making a good video for email. A lot of people still prefer to outsource their video creation for a variety of reasons. For those that are looking for a quality video creation company to create amazing videos at amazingly friendly prices, they can pay us a visit at Videogalleria.com, and benefit from our top notch creativity. I am glad to hear you found the article helpful. Thanks for sharing your thoughts!